Solution Real is the PUP that uses misleading techniques to prevent removal. Use Reimage to locate malicious components and get rid of them faster than with uninstall instructions. A full system scan blocks virus reappearance and prevents traffic to malicious domains. How can Solution Real appear on my computer? How to remove Solution Real virus? 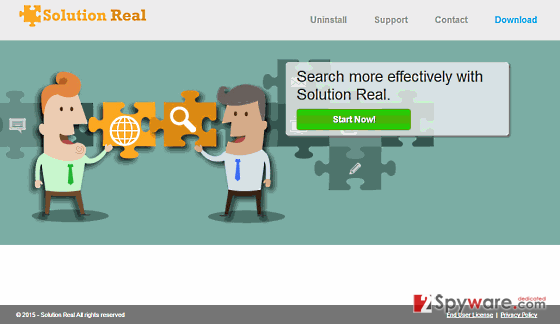 Solution Real is a legitimate browser add-on that claims to enhance user’s web browsing experience. Unfortunately, after investigating this app security experts have found that it is set to implement a list of unwanted activities behind user’s back. Consequently, if it gets inside a PC, it may start using your computer’s resources, slow it down, deliver an excessive amount of commercial advertisements, cause redirects to sponsored websites and even track your online activities. That’s why we do not recommend you to install it and use. Unfortunately, Solution Real virus is a very suspicious browser plug-in because it may appear on your computer even if you had no intentions to install it. That’s because its developers rely on ‘bundling’ that is closely related to various freewares and sharewares. Since people install programs, such as download managers, PDF creators, media players, etc. on a daily basis, Solution Real add-on reaches a wide ‘audience’ by traveling along with them. We highly do not recommend you to keep this app inside a PC because it will not only annoy you to death by delivering tons of ‘Ads by Solution Real’, but may also try to redirect you to sponsored websites some of which may even be unsafe. Moreover, even if you are not against disclosing your search queries, websites that you visit, data that you enter online and similar data, you should not keep this add-on because it may use non-personally identifiable information about you for wrong reasons, such as to flood you with appealing ads or even spam. Thus, do not hesitate and run a full system scan with Reimage if Solution Real redirects have already started bothering you. Solution Real is a web browser add-on that is compatible with Google Chrome, Mozilla Firefox, and Internet Explorer. However, by saying compatible we do not simply mean that it can work on them. In fact, it means that it can hijack them all, modify various settings, install cookies and start displaying sponsored advertisements no matter if you want that or not. That may happen right after installation of another free software. As we have already mentioned, Solution Real virus is spread around using ‘bundling’ and that’s why it has been labeled as a potentially unwanted program (also known as adware). Technically, this program is not a virus. However, if you have already been tricked into installing it on your computer, do not wait any longer. As we have said, this program may start tracking your browsing activity and may collect your search terms, mostly visited websites and data that you enter when visiting these sites. Besides, it may start bothering you with tons of different ads, in-text links, banners and similar content that may mislead you. If you want to avoid that, you should follow the removal guidelines that are given down below and remove Solution Real adware. Here, look for Solution Real or any other recently installed suspicious programs. Wait until you see Applications folder and look for Solution Real or any other suspicious programs on it. Now right click on every of such entries and select Move to Trash. When in the new window, check Delete personal settings and select Reset again to complete Solution Real removal. Once these steps are finished, Solution Real should be removed from your Microsoft Edge browser. Here, select Solution Real and other questionable plugins. Click Remove to delete these entries. Now you will see Reset Firefox to its default state message with Reset Firefox button. Click this button for several times and complete Solution Real removal. Here, select Solution Real and other malicious plugins and select trash icon to delete these entries. Click Reset to confirm this action and complete Solution Real removal. Here, select Extensions and look for Solution Real or other suspicious entries. Click on the Uninstall button to get rid each of them. Now you will see a detailed dialog window filled with reset options. All of those options are usually checked, but you can specify which of them you want to reset. Click the Reset button to complete Solution Real removal process. This entry was posted on 2015-10-02 at 04:42 and is filed under Adware, Viruses. You can quickly scan the QR code with your mobile device and have Ads by Solution Real manual removal instructions right in your pocket. 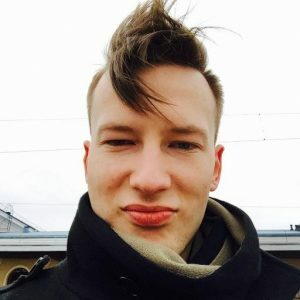 How did you remove Solution Real ads?